Walking into some stores is like watching a mood ring change from red to blue - one minute you're out-&-about, the next you've wound down to a level of moderate serenity. RVCA is not one of those stores. Even when you are well inside, the mood ring stays a at bright red level of heightened sensibility. 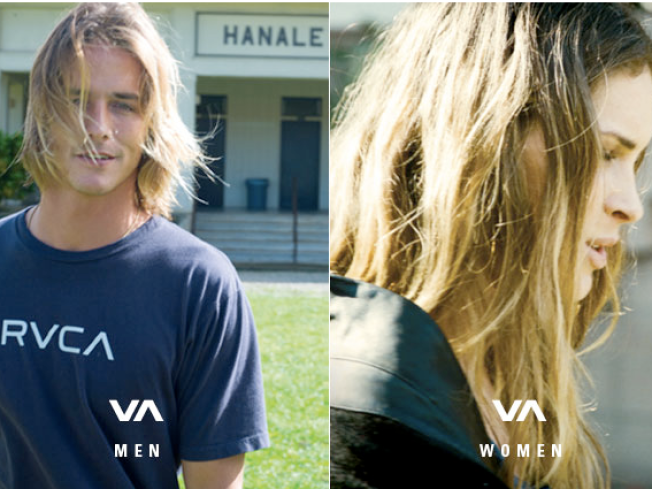 The rhythm of RVCA is just as presto as any street scene and way more interesting. Everywhere you look there's lots of eye candy to choose from, some just for fun and some for enriching life. RVCA merchandise caters to the California lifestyle, even if you’re not living in California. RVCA is the zeigeist at its finest hour. It's a store with the attitude of the young and hip, it's urban, it's California, it's crisscross culture. To the casual observer it seems that anything goes at this store, but look a little closer and the guidelines become clear. What WAS-COOL in the 50’s, 60’s, 70’s & 80’s has been re-invented to create the NOW-COOL. Attitude: You can sit in a black leather armchair under a curving chandelier and browse through a book. By-the-way, they publish their own magazine. Clothes: You can buy statement t-shirts, comfortable mini skirts (do comfortable & mini usually go together?? ), miniscule jeans, black leather halter vests in two, yes that’s right, TWO styles, and cotton plaid jumpers that are actually mini shorts. The list goes on to include jewelry and a variety of accessories. Art and Literature: They have their own in-store art gallery and a variety of books that coincide with their philosophy. RVCA has set out to establish and nurture traditions of the new century, and to reinforce a belief in living life with sincerity, honesty and concern. Once you leave RVCA, be sure to keep following the guidelines and enjoy surfing, bowling, boarding and biking. Lexie Quiring can lead you to all kinds of lifestyle stores at Shop SF With Lexie. Email her here!